An untypical few days of very cold weather were the prelude to this day of wonderful soaring. I launched at 1:31 into a powerful cycle and immediately climbed out. I topped out at 7700 over St. Helena and soon was over the back heading toward Lake Berryessa. The winds were WNW at 17. The temperature at this alt. was 15.4 deg.f. The clouds were big and had nice black bottoms so I knew it was a happenin day. I got across Pope Valley on the north end with no problems. I stayed with the clouds, crossed the Blue Ridge and headed across Capay Valley for the Central Valley. Winds had switched to SSW at 9 at the Blue Ridge. I climbed to 7800 on the other side of the valley and headed out to the flats, crossing I 5 at Harrington on a NE track. I was soon down to 1600′ and hit the strong SE wind in the valley. As there were no more clouds in the valley to the East I decided to follow the lift to the N. This was easy to do as there were dust devils everywhere on this track with clouds over them. I burbled along low for 15 miles and finally caught a good one near the Colusa airport back to 5600′. From there I flew over Colusa then up the East side of the Sacramento Rvr till Princeton where I decided the dust devils and clouds looked better on the west side. Winds are SSE at 20 in this area and I’m showing 45 to 50 mph ground speeds on my glides. Came in over Willows and from there followed I 5 north. Fewer dust devils in this area as the fields are different crops or pastures than farther south. The best lift appeared to be more to the west but the roads in that area are few and far apart, and I wasn’t having much trouble staying up anyway. North of Orland I got low again, down to 1200′, but found a good one back to 6600′ at 5:50, 85 miles out. 22.6 deg f. here. I glided to 98 miles out but was down to 2200′. I could see Red Bluff airport but needed some more alt. to get there. I found it and came in over the airport at 1800′. I had intended to land here but the airport is a ways from town and I hit some more lift which gave me the ability to make it to another field which was closer to the freeway. This field is just north of the Hwy 36 / I5 intersection on the east side of the Sacramento River. I landed in a nice 10 mph SE wind at 6.44pm, 108 miles out. 5hrs. 13mns of kissing the sky. Broke down, stashed my equipment with some nice folks across the street who saw me land, and then they gave me a ride the one mile to the local motel and restaurant strip. In the morning, I got hold of Larry Roberts who was at Williams soaring center and he graciously came and got me. Not only that; he then took me for a sailplane ride in the 66ft. wingspan DG 505 40:1 tandem ship at Williams that afternoon. 40:1 is fantastic performance but the wind in my face and no cockpit sorrounding me is my style of flying, for now anyway. Thanks Larry!! 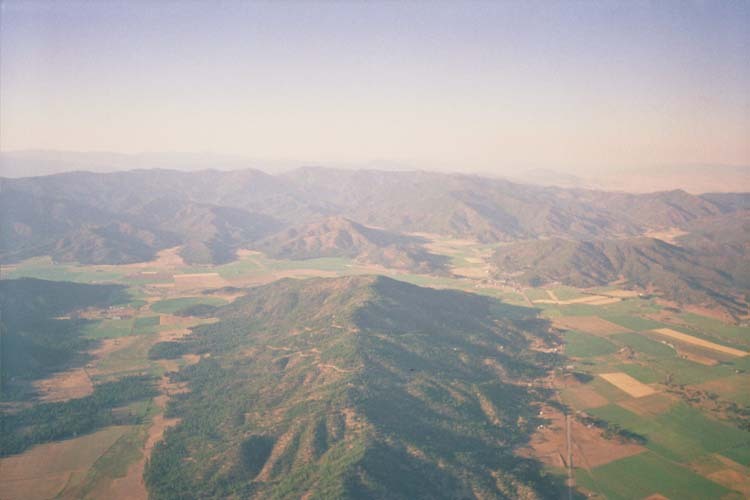 This entry was posted in Flight Reports and tagged Hang Gliding, Site Record on April 20, 2008 by Reavis Sutphin-Gray. Sunday I headed for High Glade along the back ridge after watching Rich and Vince losing lots of altitude going to Pitney. The only trouble was, the second half of the day hadn’t turned on yet and I was forced to land on the road on the ridge top after 6.2 miles. They, of course, climbed back out and were over the back of Bartlett soon thereafter. Monday was a different story. Here it is. Donna, my good friend and driver extrordinaire, was chasing. That morning, we learned that Kurt had gone far the day before. Just how far is far enough, right Kurt? Today I launched after Kurt into a nice thermal at 1:40 and by 1:53 I was at 7300′ and headed for the backside of Pitney and forming the cu’s there. I stayed above 6000′ till over High Glade fire tower, where I dropped to 5500′. I had to come back out front to find 500 up, to 7000′. All the clouds were over the back over Twin Valley and Goat Mt. so that’s where I went. At 6000′ just past the big LZ at the bottom of Twin Valley I climbed under a cloud to 7600′ then up on to Pacific Ridge, staying over the sunny slopes that weren’t being shaded by the massive development on Goat Mt. After 1 hr. I was only 12 miles out. I climbed to 9300′ over Horse Rock on the southern end of Pacific Ridge. I sent Donna to the Hwy 20 / Bear Valley Rd. intersection, knowing I at least would make Bear Valley. She gassed up my rig on the way. I followed the clouds past the north end of Indian Valley Reservoir, out under a nice cu which took me back to 9300′ over the north end of Bear Valley. I glided across Bear to the north end of Cortina Ridge where Hwy 20 drops into the Central Valley. Donna is at the Hwy 20 /16 split a few miles away. There are nice clouds around but it takes me a while to find a decent core to get high enough with so I feel comfortable with the jump to Rumsey at the north end of Capay valley. At Lytle Mt., just before the gap, I climb to my max altitude for the day of 9469′ with what I believe was the Duo Discus sailplane from Crazy Creek under me. I top out cross the gap and climb to 9400′ again in another beautiful thermal and cu. The sailplane is following me. He comes in again lower but closer this time maybe 200 feet separating us. I top out at cloudbase and head south. The sailplane comes in along side me for a final wave before pealing off toward Crazy Creek. After 3 hrs. I’m only 45 miles out. I glide south down the Blue Ridge but the clouds are all but gone and I need 40 more miles to set a new record!! A little cu forms over Canterbury Mt. on the secondary ridge behind Blue Ridge. I get there at 3800′ 60 miles out and climb slowly to 7000′, drifting SE in light NWsterly winds. Donna heads for Winters on I 505 to my SE. After 4 hrs. I’m 67 miles out. There is a little wispy cu forming over I 505 2 miles south of Winters so I go there. I’m at 3000′ when I get there but find nothing as it dissipates. I can see I 80 to my south and know if I cross it I’ll be real close to a new record. There’s fields and roads everywhere so I Go for It. Down to 2000′ a few miles from Dixon and I 80 I find some lift over a line of plowed fields and climb to 3200′ as I drift across I 80. I punch up my distance page and I’m at 82 miles out. Yahoo!, the record is mine. Donna is under me driving through town using me as her Airstar navigation system as I glide for another 8 miles and land at the intersection of Levee and King Rds. A good omen in my mind for the King meet later this summer. It’s 6:34 and I’m 90.5 miles out!! 4hrs. 54min. This entry was posted in Flight Reports and tagged Hang Gliding, Site Record on May 29, 2006 by Reavis Sutphin-Gray. Launched at just after 2 in 25ish winds. Just a tad of west cross. Leo and Scot were off within minutes after me. Bee-lined for the Grade and had just passed 3,000 when clouds started to form around and below me so I started heading out over the water, still climbing. Over the next 20 minutes the Grade really grew a big cap cloud and we had to fly out and spiral down a bit to stay clear of the clouds. After 15 minutes of this and some photos I thought I’d head over to Jenner to check out the lift there when Scot inquired as to where I was going. Leo said he’d eventually land and chase us if we wanted so just like that Scot and I headed out. Maintained at 2300ish all the way to Jenner then sunk all the way to Red Hill to about 1,400. Turned into the wind expecting a fast climb out but it was pretty light. Had a SLOW climb there then moved southwest to the better faces overlooking Wrights Beach and got back up to 1900. We decided to keep going and headed over to Coleman Valley, then the faces overlooking Chancelor Guest Ranch, then the smaller ones to the southeast of Bay Hill Road overlooking Bodega Bay. slowly getting lower and lower. Would have been nice if it had been stronger. Half way between Bay Hill Road and the Bodega Bay golf course we worked a few little knobs and gained a bit in some light thermals but eventually the bottom fell out and we were on glide for a landing next to the east end of Doran Beach on the golfing green. But then I remembered the little cliffs that start up at the east end of Doran so I pulled on some speed to get there with a bit of altitude so I could do a few passes before landing. Was slightly cross on the cliffs from the west but good enough for a pass to the southeast so I ventured that way to see what was up. Meanwhile, Scot came into the cliffs low (unzipped at this point) but we found that we could sustain here. I think I got there at 380 feet above sea level. After about 10 passes to make sure the lift could sustain us there, I flew to another set of faces a few hundred yards further southeast (and away from our only LZ) but figured I could get back if I started to sink out. The next set worked and I was able to fly back to the cliffs overlooking the LZ at the green. So now at a whopping 430 feet, I made another move further southeast to some higher cliffs that faced just a bit more into the wind. These were a long way from the golfing green LZ but I knew that just over the hill out of sight to the southeast was the American Estero and its nice big bailout beach LZ. This set of cliffs worked much better. Plus, we were getting out of the windshadow effect from Bodega Head that was blanketing our first section of the Doran cliffs. Worked this next set to about 700 then crossed the American Estero, flying over a section of very low and crappy ridge to a short but pretty high and vertical cliff that was facing right into the wind. I knew that if we could climb out on this one, we’d have Dillon made because the rest of the cliffs were pretty high. Plenty of lift on this one so Scot and I just kept floating along, working the bowls at about 700 feet and enjoying the view on this never before soared section of ridge between Doran and Dillon. No beaches to land on but miles and miles of top landable terrain all over the place. At that point we asked Leo to go to Dillon. Pulled into Dillon Beach and floated around at 800-1050 over those nice southwest faces with the houses all over them for about 30 minutes then landed for a 2.5 hour flight. I think Scot said it was 19 miles from launch. Leo showed up just as I was unhooking from my glider. On a slightly stronger day, I believe that a flight from the Grade to Dillon would be pretty straight forward. A big thanks to Mr. Jones. Next time, Leo, I’ll drive for you! This entry was posted in Flight Reports and tagged Hang Gliding, Site Record on February 28, 2006 by Reavis Sutphin-Gray. Matt Terkiele and Ken Muscio met me in Stonyford for the ride up St. John. They were on their way back from Chelan and points north where the flying had been lousy, or so they said. Pete, my trusty driver, was ready for a serious chase as he brought an overnight pack and a change of underwear. I guess he’s catching the spirit of things!!! I launched first at 12:42 as the convergence started setting up and the cycles finally straightened out. I climbed to 9,300′ and headed for Crockett Peak to hook up with the convergence. I was down to 6,400 ft., 1 mile west of Crockett, before I got into the convergence and climbed to 11,000′. The sky to the north looked better than it had on Monday; there had been no clouds in this area then. I made good time until the 20 mile mark, where the convergence line was broken. But then another formed on the back side of Hull. I got down to 5,100 ft. over Rocky Basin Ridge before I hooked into something that took me back to 12,000′. Before I found that elevator, I was scratching low, 700 ft. below the ridge top. I could see a possible side hill landing spot at the bottom of the ridge, and there was also a road there. With an LZ within reach, I was free to patiently look for lift, and a low low save was my reward. After getting high and back under the clouds, it was easy sailing to the Yolla Bolly Wilderness Area. The clouds made a northwest line from the Soloman Peak area, which I followed. I started wondering if it was over developing, or something, as there wasn’t much sun on the ground. I followed the darkest areas of clouds and found easy going, dolphin flying for miles, staying right near the cloudbase of 10,500 ft. I was looking at Ruth Resorvoir as I crossed Hwy. #36 near Forest Glen, heading north. I crossed Hyampom Rd., east of Hyampom about 2miles, on a NW track. Pete was in Hayfork, having come up Hwy. #36 from the valley. 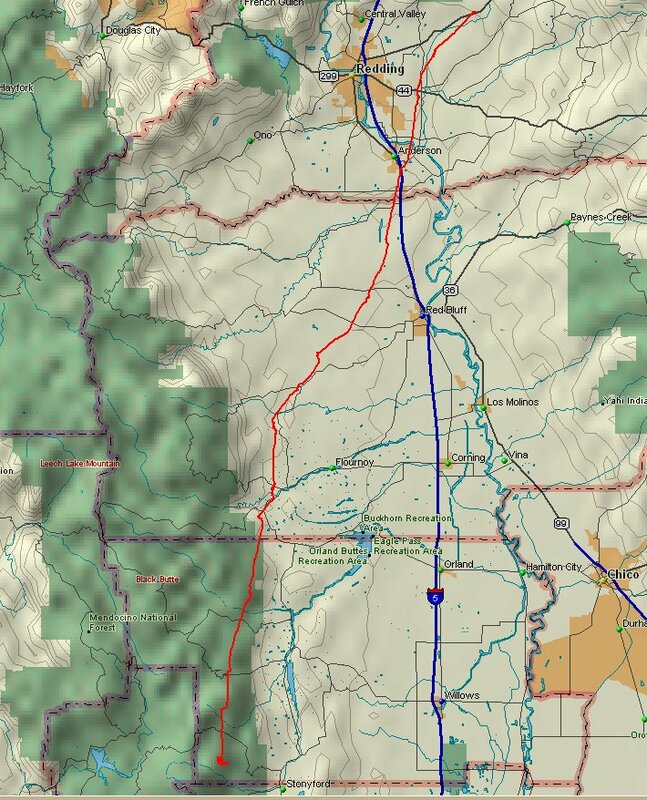 I hadn’t studied the roads in this area so I had Pete look at the map for a way around the Trinity Alps on the west side. He said Hwy. #299 hooked up with Hwy. #96, which then headed north. As there were no clouds over the Trinitys, I decided not to brave the crossing. Instead, I followed the cloudstreet until it ended and I hit a forest fire. For a while, I was flying through smoke, watching helicopters drop water on the flames. I could see Hwy. #299, but it was in a deep gorge here so I shied away from it. Later, driving home after the retrieve, I was glad I had stayed away from the gorge, as it is highway, rocks and river most of the way back to Weaverville. I landed on the South fork of the Trinity River, on South Fork Rd., about 3 miles south of Salyer on Hwy. #299. I got turned 90 degrees close to the ground and whacked hard, taking out a down tube and pushing my sunglasses into my forehead – a little blood but not bad. Ken and Matt didn’t like the launch conditions when I took off, so I’m assuming they launched later and flew to Stonyford; their truck was gone when Pete and I rolled through town around 1AM. Glider flown: Laminar MRX 700, a flex wing. Landing GPS Coordinates: N40deg. 51min. 36sec., W123deg. 34min. 59sec. Distance traveled: 110.0 miles. A new St. John flex wing site record! This record-breaking flight was the very next flight after my flight on 7/26 from St. John that set a new rigid wing site record. I flew the same route this time as I did then. This route is not for the faint of heart. There are areas of no LZ’s (no road next to your field), but there are places to land. It just may take you some time to hike out. 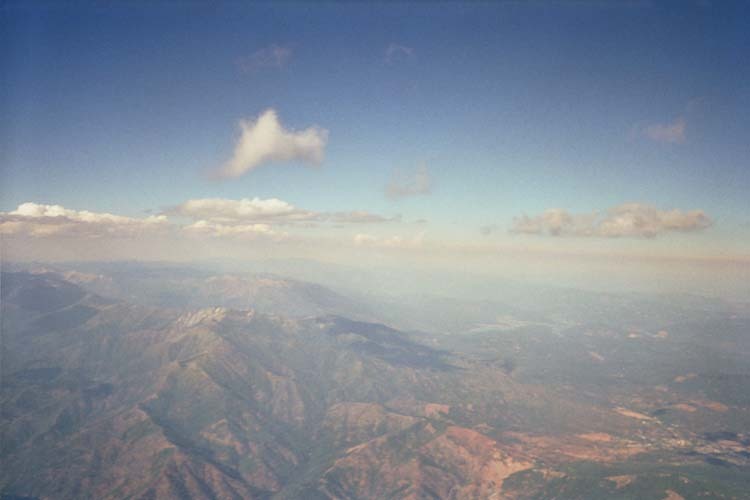 When I flew through the smoke from the fire, I was about 9,000′ MSL and the helicopters were at tree level, around 2,000′. The fire itself was 8 miles to my west so I don’t think I was in restricted air space. I feel the route over the Trinitys will eventually give me a 200 mile flight, after a few more trips, and trusting the lift lines. I hope to make Grants Pass Oregon, or north of Medford, Oregon. I’ve signed up at the local library so I’ll have internet access when I choose to come over here. 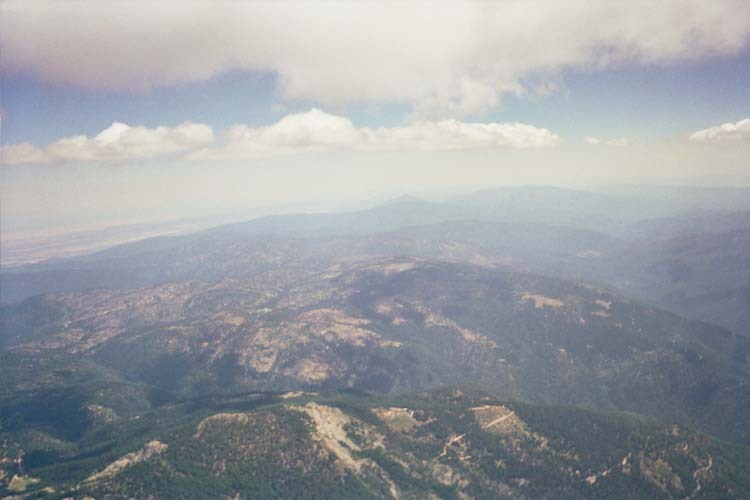 This entry was posted in Flight Reports and tagged Hang Gliding, Site Record on July 31, 2004 by Reavis Sutphin-Gray. Scot Huber’ story of setting the site record at St. John. 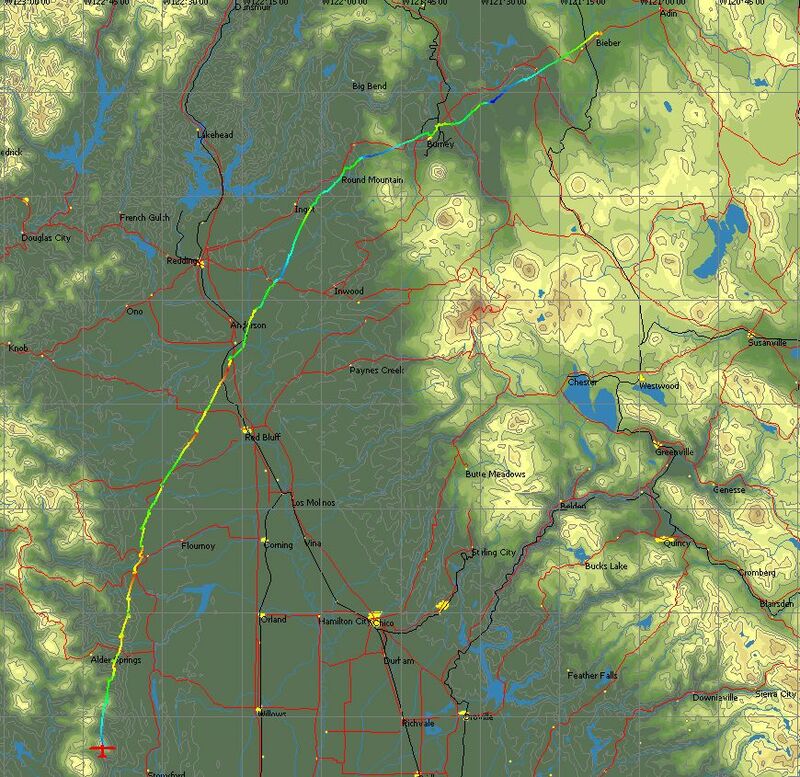 Saturday’s flight: 52.7 miles, 3 hrs 22 minutes, valley route. Sunday’s flight: 51.8 miles, 3 hrs 32 min, valley route. Monday, I decided the convergence zone, which Sunday had been absolutely perfect, was what I was ready for. I launched at 12:06 into a nice cycle in the blue sky. I climbed to 9300 ft. by 12:29 and headed west to Crockett Peak. I was at 8000 ft. when I found lift back to 11,500 at 12:52. Clouds were forming 18 miles to the north. I headed toward them, knowing that I had the basin LZ if I didn’t make it to them. By the time I got to the clouds, I was at 8200 ft over Spanish Ridge and climbed back to cloud base at 11,500. It was 1:40. It looked good to the north, with a convergence zone setting up. I was over Alder Springs Road, heading for Government Flat, following the highway in the sky (the cloud street). There are some clear cuts and meadows which looked land-able in this area. At Anthony Peak, I climbed from 9400 ft. back to 11700. It was 2:44. I was 41.3 miles out. I knew the Yolla Bolly wilderness area was in front of me but I was confident about crossing it, based on my flight to this point. I headed north. At 54 miles out I was down to 9400 ft., when I caught a good one back to 12400 at North Yolla Bolly Mt. I was across the wilderness area, and high. I knew hwy 36 was reachable with this altitude. The sky highway bent west from this point toward Red Mt. and the Hwy. 3/36 intersection. I followed it but was losing big altitude so I headed back to my last thermal and topped out again. I headed north, leaving the clouds, hoping to find lift after crossing the pass and reaching the Trinity Mountains to the north. I crossed Hwy. 36 with an LZ below me, but I was losing altitude rapidly. I worked light lift at Knob Peak in a SE wind, drifting with it away from my LZ. After gaining enough altitude, I could see some LZs near Wildwood. It was 3:55; I was 69 miles out and at 7000 ft. I had my driver, Pete, come out hwy 36, as it didn’t look good. He was near Cottonwood then. I drifted over Wildwood, checking out LZ options, getting down to 4700 ft. I found some light lift back to 7200, drifting to the NW. I was determined to get back to the clouds, which were over Hwy 3. I could see more LZs along 13 Dips Rd. and then Hwy. 3 at Peanut so I went with the flow, hoping for lift. I burbled along, but was losing altitude where Hwy. 3 comes into Hayfork. I was at 3900 ft.; there were lots of places to land; but I was looking for lift. I found it as the wind went west again. Climbing slowly, I drifted over the Hayfork airport. At 5400 ft., the lift went thermal nuclear: solid 1100 fpm took me to 12000 ft. It was 5:10. I was 85 miles out. Back on track under the skyway, I was a happy man. I headed NE to Barker Mt. and climbed to 13400 ft. I knew the Trinity Alps Wilderness was in front of me but I had no pucker factor with all this altitude. I knew that Hwy. 3 followed Clair Engle Lake and I knew that if no LZs could be found, I could land on the shore of the lake, as it is low this time of year. I hit the Alps at Weaver Bally, NW of Weaverville. I climbed to my max altitude for the day of 13,623 ft. at Monument Peak, 98 miles out, at 5:35. I decided to keep Hwy. 3 within a glide so I stayed on the east side of the clouds, which stretched to the north. I crossed over Siligo Peak, then headed due north from there. At Black Mt., I was down to 9700 ft., which felt low at this point, but I caught lift back to 11200. It was 6pm, 111.6 miles out. Summerville, to my west, was my bailout LZ, as I could see a nice meadow there. I dolphin flew for 10 miles, losing little altitude. At 10400 ft., I circled up to 12300 in a good one. I could see Scott Valley, which from previous map study I knew was there, so I knew I was over the Alps safely. I followed the skyway over Russian Peak and over the east edge of the Marble Mountains. I hit Etna Mt., climbing from 9300 to 12600. It was 6:55, 136 miles out. The clouds dried up at this point so I crossed Whisky Butte, then headed NE for Ft. Jones (which I thought was Yreka) at the end of the valley. Pete had headed for Eureka from Weaverville, mistaking my radio transmission. I hadn’t heard from him for a while so I figured that landing near a town was a good idea. I crossed over Ft. Jones at 6000 ft. at 7:22, 151 miles out. I wanted to break my personal best flight of 152 miles from McClellan last year so I cruised Hwy. 3 to the end of the valley. At the last LZ in the valley, I was at 151.7 miles. I made some turns at the end hoping for some help to get me up and over the hills, not knowing what was over them. I found enough lift to climb from 4600 to 6600 where I could see some fields along the road on the other side. I cleared the pass with 200 ft. and glided into the valley to my landing field at Oberlin rd., along Interstate 5. A local lady and her daughter stopped and told me I was in Yreka. It was 8:10. I was 158.4 miles out. I called Pete but couldn’t get his cell phone, so I called his wife Maureen and informed her I was in Yreka. Pete called her 10 minutes later and learned of my location. He was 50 miles west of Weaverville on Hwy. 299, so he knew he had a long drive ahead of him. I broke down, walked the 4 blocks to Main St. and had dinner. I then booked a hotel room. Pete got to Yreka at 15 minutes after midnight. We drove home Tuesday. This was a magical flight for me, over some of the most beautiful scenery I’ve ever laid eyes on. If you’ve never been in the Trinity Alps, I suggest you make the trip. The Russian Wilderness Area and the Marble Mountains are equal as eye candy. I hope to spend some time in all three some time soon. I have 20 more pictures from this flight that I hope to show at the next meeting. Stay high. Follow the skyway. I’m heading out from St. John, looking back at it in the distance. Notice that I’m not over the “knees” of the ridges, but way deep. Even further on course, still following the “highway” (clouds). My nose is pointing back at St. John. That’s the valley out beyond my wing. The Trinity Alps. That’s Red Mt. / Siligo Peak in front of me. Coffee Crk. Rd. is in the canyon on the left. I’m still following the “highway”. Looking South. Siligo Peak is just under my wing tip. The canyon on the right, crossing in mid-photo, is Coffee Creek Rd., the access road to Caribou Lakes. Coming up on my valley – Scott Valley that is. Etna is in this end of the valley. 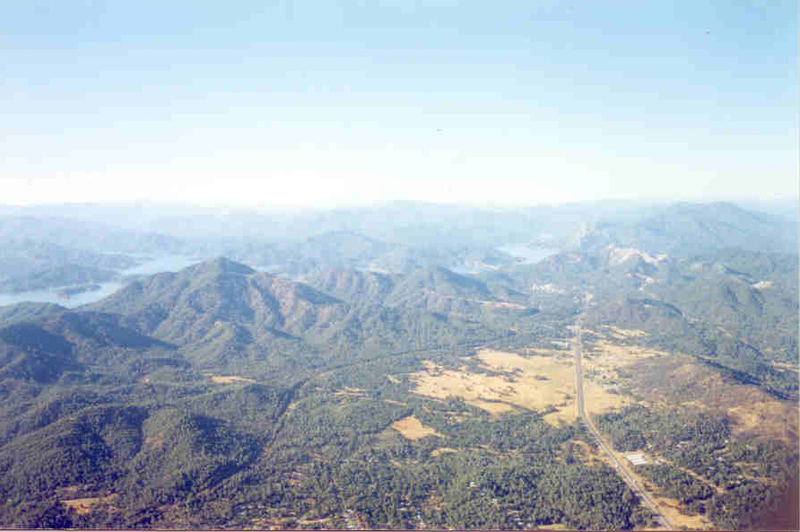 I took the direct route over Ft. Jones (at the far end of this ridge) toward Yreka (top-right of photo), where I landed next to Hwy 5 and Oberlin Rd. 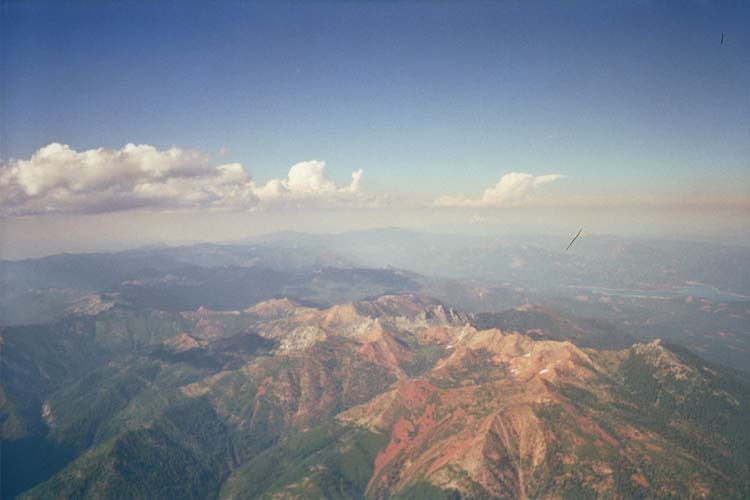 This entry was posted in Flight Reports and tagged Hang Gliding, Site Record on July 27, 2004 by Reavis Sutphin-Gray. This might be premature, but here are the results of the third annual St. John record encampment. For the third year in a row a site record has been set. The new absolute distance record for St. John is now 144.4 miles! Nancy, two dogs, a parrot and myself arrived at the top of St. John on Thursday night, about 10:00pm. Greg Sugg was already set up in his trailer. Greg had just arrived from King and Lakeview where it overdeveloped every day. When he arrived in the afternoon, St. John was overdeveloped and raining. He was thinking, “Here we go again”. Friday morning looked great. CU’s were popping over the mountain by 10:30. It looked like it would be just Greg and me for today. I set up my glider early and started doing some of the tuning I had learned in Austria. I got 3 of the 7 items done. As a final preflight, I check the control cable where it goes over the pulley and found one of them frayed. It was not like this before I left for Florida in April and this was the first time I had set up my glider since then. I decided not to fly even though it looked like a 100+ mile day. I called Rich Sauer and asked if he could bring some 2mm cable and his swaging tool when he came up on Saturday. He said he could. Greg decided he did not want to fly alone so we all went down to the river and went swimming. Friday night Matt and Lori, Todd and Suzie, and Leo came to camp at the top. Greg had a fire permit, so Matt built a nice fire and we sat around swapping stories and lies. On Saturday morning Rich, Bill, Linda and Kim drove up along with Ernie, Jon James, and Lou. It looked like we had a good turnout. The CU’s did not start popping until 11:00. It was not until 11:30 that they started to stay over the mountain. I made a new cable and got my glider all set to fly (thanks for the help, Rich). By 11:50 Todd, Rich and I were hooked in and ready to launch. I was trying to get an early launch, since last year we did not launch until 1:30. I was hoping that the extra hour and a half would add up to a new record. The old rigid record was 96 miles and the flex wing record was 92 miles. Todd, then I and then Rich launched. We three were in the air by 12:02. We climbed almost directly to 9,300′ and headed north. The winds were all over the place. They were 20 mph from the west up high (this put us in the lee side) and east, south, or west lower. After leaving St. John, we tried 5 thermals in the first 20 miles and never climbed more than 300′ in any of them. They were shredded with cores all over the place. About this time the rest of the guys launched and started heading our way. Rich was concerned that we had launched too early. We finally climbed 1600′ in a thermal and headed toward Paskenta (the 30 mile mark). I had taken 2 hours for the first 30 miles. Rich and Todd took a different line than me and were one thermal behind at Paskenta. My glider was flying great, at least 5 mph faster with the same bar pressure and sink rate. I was flying 10 mph faster than Todd at the same sink rate. For the first time I felt I was noticeably out performing Rich. For the next three thermals after Paskenta I would top out and try and wait for Rich and Todd, but they fell behind and I decided to speed up. I covered the next 30 miles in an hour and twenty minutes. Rich and Todd were 10 miles behind. I hit a hard section from 50 to 70 miles, only two thermals and some really long glides. When Rich and Todd hit this section they hit the deck for about 64 miles. Jon and Greg were still in the air at the 50-mile mark. Leo was down north of Paskenta and Matt had landed just south of Chrome (21 miles). Ernie landed somewhere but no one knew exactly where. The thermals so far where still very broken and hard to core. They were also rough. With the changes I made to my glider, I now had to push out while thermaling, which was tiring my arms. At the 70-mile mark the thermals got better (higher and stronger). I had been climbing to 5,000′ agl but now was climbing to 6,000′ agl. I covered the next 30 miles in an hour. At the 90-mile mark I climbed to 8,200′ msl and figured I had a new site record as well as the first 100-mile flight from St. John (and, sorry Scot, the coffee can). At the 100 mile mark the real fun began. I would have to climb over a 5,000′ pass and cross the Sierras to continue my flight. Just past Round Mountain and 4 miles before the pass I climbed to 9,600′ and had the pass easily. I was on my way to Burney, 114 miles from St. John. There were plenty of LZs around the town of Burney and I was down to 2,000′ agl. To go any farther, I would have to cross 9 miles of forest and another mountain range 2 miles across. I climbed in 100 fpm for 1000′. I had drifted to the southeast and my course was to the northeast. Just as I was getting as far as comfortable from my last LZ in Burney, my thermal turned on a little and I was back to 7,400′. This was just enough to get me across the forest and then mountains to Fall River Mills. My designated goal for today was Fall River Mills (127 miles). I headed for the airport hoping I could make it with the altitude I had. Just before arriving, I hit one of the best thermals of the day and climbed to 10,100′. Fall River Mills is in a big valley. To continue I would have to cross another mountain range. The wind was now from the northwest and I had to fight a cross wind to stay on course. The area in front of me was completely shaded by clouds. I crossed the next mountains with 500 feet to spare and never hit another bump of lift (but lots of turbulence). I noticed an airport at the town of Bieber. I had just enough altitude to make a normal aircraft approach and landing, 144.4 miles from St. John, almost 50 miles longer than the previous record. This was my longest flight in both distance and duration (6 hours and 3 minutes). This was also a record for Nancy to retrieve. She left the mountain an hour before we launched (it takes that long just to drive down). She stopped twice for gas and was only 2 miles behind me when I landed. She drove for more than 7 hours and 250+ miles. Here is a picture of me after 6 hours in the air and my new “Bruce Barmakian hairdo”. Rich and Todd got the longest flex wing flights of the year. Greg and Jon got their second best flights from St. John. Ernie also got his best flight for St. John. I will leave it to him to tell his story. My new goal is to fly to Lakeview from St. John. If anyone has the GPS coordinates for the center of the spot at the Lakeview LZ, please email them to me. It would be great to end a 220+ mile flight at a spot landing contest. This entry was posted in Flight Reports and tagged Hang Gliding, Site Record on July 1, 2004 by Reavis Sutphin-Gray. The turn out for the second annual St. John record encampment was smaller than last year (St. John is located in Northern California’s coastal range). Most of the Sonoma wing pilots had just gotten back from King and could not make it. Matt and Lori as well as Greg Sugg came straight from King, without stopping by their houses first. Thursday, July 3rd we had Vince, Nancy, Matt, Lori, Greg and Jon present. Matt had an incident at King, which took his glider out of action for the time being. Jon was nice enough to bring up his spare Fusion for Matt to fly. After we had all set up, Greg noticed a problem with the heart bolt on the glider Matt was going to fly. Greg and Matt started working on the problem. It was getting late, almost two o’clock when Jon and I decided to fly and if Matt and Greg could fix the problem, they would join us. I launched right after Jon and had to fly over to the switchbacks to find any lift. Jon had found something to the left of launch. We climbed over the top of the mountain to 9,500′, which was the top of the lift, and headed north. I did not find the convergence line as well as I have in the past and was getting lower than I was used to. I heard Jon say he was climbing at Alder Springs road. This was the last I heard from Jon until he landed. I arrived below the mine at Red and climbed my way over the top to continue toward Paskenta (33 miles). The lift turned on just south of Paskenta and I was on my way. When I was at the 48-mile mark, I heard Jon call that he was on the ground on Lowery road just north of Paskenta. Nancy was already past him by this point. Matt and Greg had just landed at the airstrip on 308 and said they could pick up Jon. The lift along my usual route was not as good as times past, but I had a good tail wind. There were a couple of times I was working zero sink and drifting almost 6 miles. I was low past Anderson (70 miles) and climbed 200′, which gave me enough to glide to a field on Hwy 44. I landed there and was greeted by a nice gentleman named Michael . He owned the field I landed in. He said he was on the phone when he looked out and saw me on the ground. He told the person he was talking to that a plane had just crashed in his field. I said it was a much better landing than a crash. Nancy arrived just after I landed. The distance was 82 miles. Jon went home on Friday and Rich Sauer, Linda and the kids arrived a short time later. I launched first, a little earlier than Thursday, but probably not early enough. I found a great thermal right in front of launch and climbed in it all the way to 10,500 (launch is 6,200′). Rich was climbing right under me and we headed north at 10,500 ft. At the first ridge to the north (4 miles out) we found another good thermal and climbed back above 10,000′. I was able to find the convergence line and several times flew in it for more than 7 minutes during which time I did not sink at all. I could have made it all the way to Paskenta (33 miles) on a glide from that second thermal. I stopped at a thermal a couple of miles past Red to wait for Rich. Once he caught up, we flew together for most of the rest of the flight. The lift was much better than Thursday, with many climbs above 6,000′ out over the flats (the central valley between Red Bluff and Redding). The wind was much lighter so we were not drifting as well as I had hoped. Just south of Anderson we got stuck for 14 minutes in very light lift. We only climbed 1,000′ in that time. This did give us enough to get up Dechutes road. I had left first and was down to 1800′ (about 1200′ agl) when I found a good thermal. Rich came in under me by about 300′ and found the lift much lighter. I was climbing at 400 to 500 fpm where he was climbing at 200 to 300 fpm. I topped out at 5000′ and he about 3000′. This is where we separated. I glided over to the field I had landed in the day before and climbed back up to 4,500′. Rich was really low and managed about three more miles than I did on Thursday, about 85 miles. At the 87-mile mark I had another great climb to 6,200′. I climbed with 5 hawks for most of 3000′. I was flying up Oak Run road headed for the 100-mile mark. The terrain climbs about 2500′ at this point. At the 96-mile mark I was at a pass that I could just glide over, but I could not see what was on the other side. According to our reconnoitering, there should be a field there to land in. Not being able to actually see it I chose to play it safe and land at the 96-mile mark. A new absolute distance record for St. John! There were three fields to land in, but none of them were very close to the road. From the one I chose, I had to hike my gear about 200 yards up hill to get to the road. Rich helped me hike my glider out. Thanks Rich. Linda was right there to pick me up. Thanks Linda. During our flight we could hear Matt and Greg having a great flight. Actually we could hear only Matt because Greg’s radio was not working. They managed to fly together quite well in spite of the radio problems. Matt landed on Johnson lane at 51.7 miles and Greg landed at 54.7 miles. We left for home Saturday so Nancy could get some time off driving and have some time for herself. Matt, Lori and Gregg also headed for home as well. Saturday looked even better than the previous two days. Even though we did not have a great turn out, we did manage a new site record as well as some darn good flights. Matt got his third best at 51.7 miles; Greg tied his best at 54.7. Jon made it past Paskenta 35.1 miles (he could have flown much further if his radio was working). Rich made his second best flight with 85 miles. I had flights of 82 miles and 96 miles (new rigid and absolute record). It is just a matter of time before someone cracks the 100-mile mark. 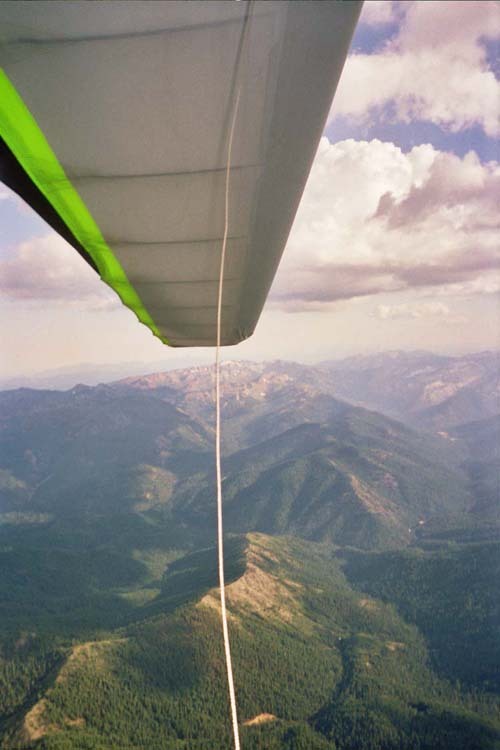 This entry was posted in Flight Reports and tagged Hang Gliding, Site Record on July 3, 2003 by Reavis Sutphin-Gray. Todd organized the SJ-RE. On Thursday, Matt, Todd, and Rich flew with Linda and Lori driving. I had to work on Thursday, so I was late getting into camp. On the drive up I could hear the action as Todd and Rich were passing the 70 mile mark. Matt was passing 50 miles. It was really exciting listing to all three of them as they continued on there record setting flights. Matt set a personal best close to 60 miles landing on highway 36 north of Red Bluff. Todd and Rich were in the air on what looked like a 100 mile flight. At 93 miles Todd realized that there were no more LZ’s and turned back to land at 90+ miles. Rich joined him a little latter. Friday only Greg and I flew. Rich had gone home and Matt and Todd were going to rest up (Matt and Lori went fishing with Matt trying to swim and fish at the same time). Todd had to have a flat fixed so he offered to drive. Greg and I left the top around 10,000′. I found a convergence line and was able to glide to Red Mountain before I needed to turn. Greg had a little busier time with it and landed near Chrome. Todd picked him up and they both started to chase me. Since Todd needed to go to Red Bluff, I tried to fly in that direction to make the retrieve easier. The thermals were OK but got weaker and weaker as I headed north. I started jumping from one east-west road to another. I told Todd to head into Red Bluff and take 5 north. I thought I could make it on a glide. What I thought was 5 was in fact a railroad track. I was low and about 4 miles from 5. I managed to drift northeast and get over to 5. At the 68 mile mark I was too low to jump to another LZ and had to land. I was 68.9 miles from St. John. Todd was a little nervous until I landed. On Saturday, John D and Charlie were in camp. Rich came back for the day. Linda, Nancy, Lori and Suzie were on the retrieve. Gregg, John then me launched, followed by Matt, then either Todd or Rich. I left first at 9,300′ with everyone else leaving later around 10,000′. I again found a convergence, but it only took me 10 miles, after that it was a struggle. I could hear everyone else behind me struggling as well. I arrived at Newville too low to cross the small ridge toward Paskenta. I started thinking about where I would land. I hit some week lift that I drifted in for 2 miles and gained 400′. This was just enough to make it over the small hills toward Paskenta. Pilots behind me started landing. I was set up to land in the first field after crossing the small hills when I hit my first real thermal since leaving St. John. This is the same spot where I got my low save last year. I climbed to 5,000’+. From here on the thermals were pretty good, most of the time I could climb above 5,000′. The night before Matt had got out his Delorme and found a promising route for a 100 mile flight. Todd had come up with a similar idea. The proposed route would cross south of the redding airport and head up a road that parallels highway 5 (Dechutes Road), from there it would hit 299. I was flying the same route that I flew the day before and passed the 68 mile mark at 4,000′. I headed up Dechutes road until I came to hwy 44. From hear I was at 82 miles. I could see 299 and the other road that Matt was talking about (Topo USA calls it Palo Cedro, it is the first road north of the 44 intersection). Now I was in a quandary. I was at 5,000′. I could either go for the coffee can and head north, or go for a 100 miler and go east. I chose the coffee can. I figured I could glide past the 90 mile mark with the south wind I was seeing. I headed for the last possible LZ I could see on 299. I arrived over it at 4500′ (I found another thermal on the way). This LZ was at 92.3 miles. I went up the road to the 95 mile mark, but could not see any more LZ’s. 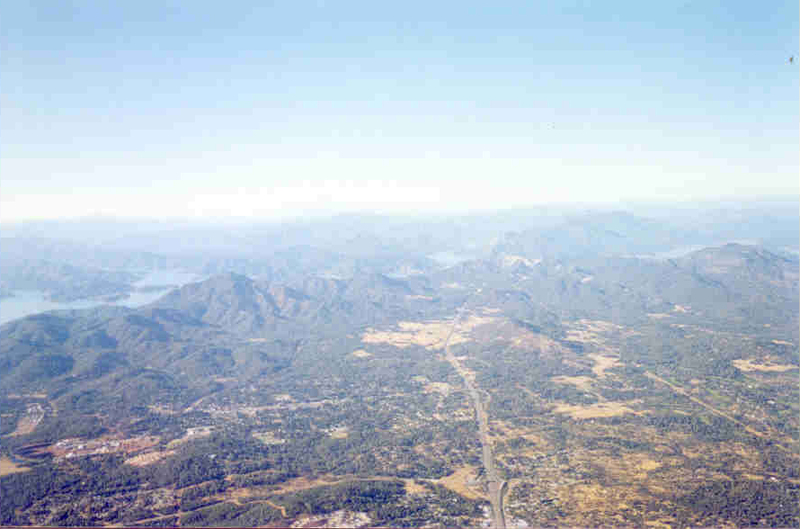 I could see more LZ’s up Palo Cedro and I called Nancy and Lori to see if they could get from 299 back to Palo Cedro. My radio batter went dead. Rather than risk a longer retrieve than I was already on, I headed back to the LZ on 299. It took quite a bit of work to get down due to the thermals, so much so that I finally threw my drogue chute. As I got lower I saw my nice LZ had rocks in it that stuck up like tomb stones over 6′ high. I landed in the best spot I could find and it was still covered in rocks the size of bowling balls. I had a great landing. My flight time was 4 hours and 11 minutes. Rich managed to get past Paskenta and found the better lift. He followed my line and landed at 68 miles on hwy 5. He or Linda can tell the story of the paramedics responding to his landing. I felt bad for Lori. She was in the truck with Nancy and did not get to see Matt land and we did not get back to the top of the mountain until 11:00 pm. I am glad she was there because she kept Nancy focused. Nancy wanted to stop and look at every critter she passed. Lori kept her driving in my direction. She was also a great navigator. Everyone headed home on Sunday, except for John and Charlie. They were going to try to fly. As we passed Williams, we heard that they were driving down. Charlie said the wind shifted from the West at launch so they bagged it. So the stats for the ST-RE were Matt, 60 miles (+ Saturday) , Rich 90 miles and 68 miles. Todd 90 miles (29 miles on Saturday), Greg got three enjoyable flights. I think John got his best at St. John. Charlie had a nice flight. I got 68.9 miles and 92.3 miles. I am off to the Worlds in Chelan. I will be back in a couple of weeks. 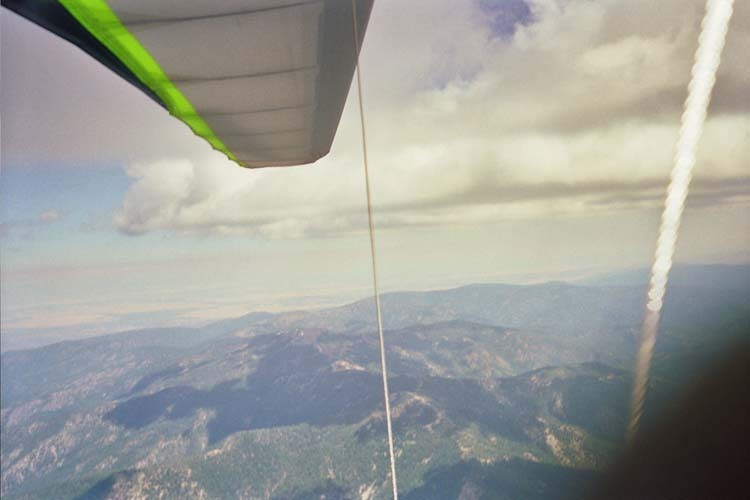 This entry was posted in Flight Reports and tagged Hang Gliding, Site Record on July 7, 2002 by Reavis Sutphin-Gray. Todd Robinson Flew 90.3 miles today from St.John. Rich played follow the leader and landed with Todd in the last available field before Lake Shasta. Matt flew around 59 miles to Redbluff. Lori and I drove for these top pilots. Just in case Todd doesn’t mention it, ask him about his close encounter(s) with the CHP plane. Awesome job guys. The day didn’t look very good but I thought if I could stay in the air for five hours I should be close to a hundred. I got off the hill about 1:20 and went right up to 9700. The going was good up until the 45 mile mark. I got low just before the bad lands and had to work it to 5500, a little low to jump the bad lands, but I went for it. About half way across I thought “what am I doing? Linda will not like this if I go down here”. “Where there is sink there is lift” is what Rich said on the radio and sure enough, Wham! I got a good one back to 7500. So now I was around the 60 mile mark and flying the valley. The lift was great over the flat if you could stay above 6000, so thats what I did all the way to Redding. My flight path took me right up I-5 where I had a close call with a C.H.P. plane. He didn’t see me so I made some turns. As soon as he spotted me he turned my way and got too close for comfort. Over Redding and the Sacramento river I was getting low right over a rock concert but I found a thermal there that smelled funny. I got real high in that one ;-). So now I am over the south end of Lake Shasta looking for an L.Z. on the north side, but its just a sea of trees down there. I called it a day and landed. My dream of 100 miles from ST.JOHN is so close!!! thnx Rich and Linda! ooohh yahh whats a guy have to do to keep the coffee can for more than two days?!!! Sat. happened pretty much like Vince reported. My foot stirrup malfunctioned and I flew head-high the whole day. My glides were greatly reduced and my feet kept going to sleep from so much pressure on them. I managed 49.2 miles and watched my coffee can record fly away in the form of Todd who got 55. His gps batteries died toward the end of the flight so he didn’t know he was .6 miles short of Rich’s record distance. If he’d of known, he said he could of squeaked out another mile or two. Greg also was real close to it. Sunday I fixed my harness. Todd decided he’d drive; Vince decided to head home. Greg and I launched at 1:35 to 1:40. I worked it in front of launch for about 10 mn. Until I caught a rocket which launched me at 1400fpm. to 11200. Greg worked the switch backs and also found strong lift to over 11000. We headed north with winds showing 17mph from the west. At launch they were from the south around 14. We found more good lift after the crossing which took us back to over 10g. The winds lightened up a bit but still were WNW around 8. Just before Alder Springs Rd. I stopped to work some light lift. Greg made a few turns in it, decided it wasn’t strong enough and headed NE across Grindstone. I stuck with it and gained enough to keep me deeper in the mts. At Doe Peak I found good lift which took me to 11200. I was just west of Red Mt. and I worked the convergence line between the strong westerly winds at this altitude and the rising valley flow which was from the south as I glided north. Greg was over near Red around 7g and fell behind me. The convergence was very narrow, I’d say 100 yards wide or so, and I dolphin flew it till the Gorge west of Paskenta where I caught another thermal to 10200. This gave me the altitude I needed to go deeper in and I was rewarded with another boomer off the east flank of Ball Mt. which took me to 11700. Needless to say things were pretty cold at this altitude and I shivered as I was only wearing a T shirt, my wind breaker, and a speed sleeve. I also only had on my batting gloves and my hands were quite numb, but I was smiling as I figured the record was going to be broken on this day. The winds at this point were showing some south component and my ground speed increased from this point on. I was deep in the mountains and knew the roads were scarce to non-existent to my NW, since this is the Yolla Bolly Middle Eel Wilderness. I therefore kept enough altitude to glide to the east should the lift disappear. I was able to fly due north, finding lift which kept me around 8 to 9400 g. I was pretty much following the 122.45 longitude line until I saw Hwy 36. I could also see the town of Beegum to my west and the Trinity Mt.s dead ahead. I wanted to get to the Trinitys and fly their southern sun-baked flanks to the NE. But as I crossed 36 the westerly winds changed my mind as I knew I’d never make it across the Bald Hills, which looked very desolate. I could see a river to my North and some nice pastures and buildings beside it. I flew there with a crossing tail wind and landed in an upper pasture as the winds were quite strong and I didn’t want to be down in the river gorge. The owners had just arrived when I’d hiked the mile to the house and they were very hospitable, allowing me to use their phone and giving me a ride to a cross road where they thought it would be easier to be found. Todd and Greg were soon on the scene and they congratulated me heartily on my flight. I love this sport! 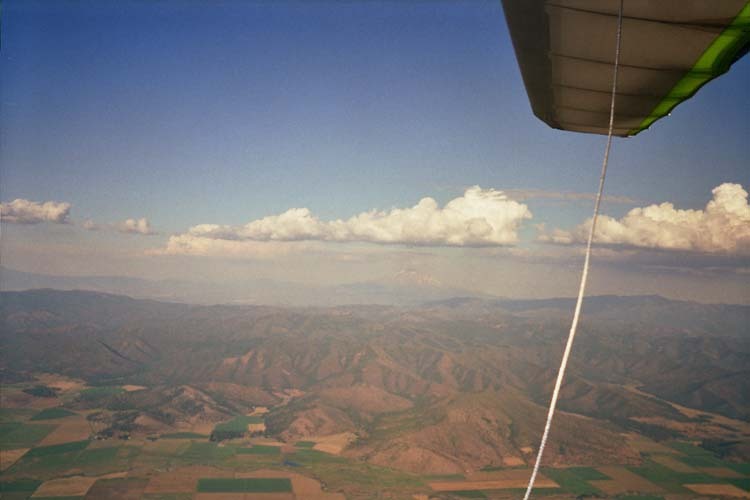 This entry was posted in Flight Reports and tagged Hang Gliding, Site Record on June 17, 2001 by Reavis Sutphin-Gray.